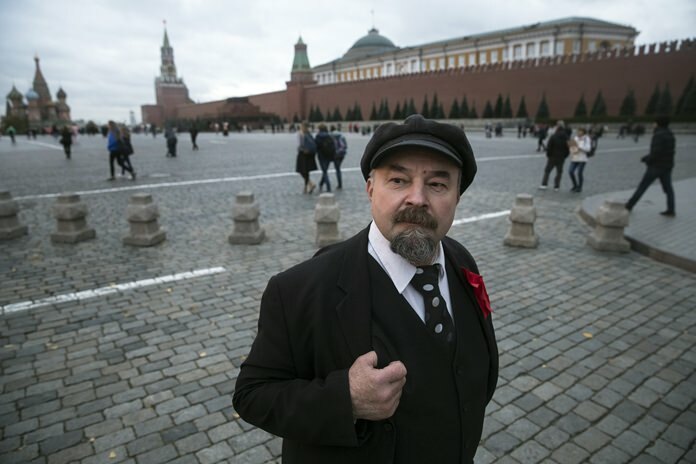 Moscow (AP) – Visitors are forbidden to photograph Vladimir Lenin’s mummified body in the mausoleum on Red Square — but nearby, Sergei Soloviev is happy to offer an alternative. On most days, the man who bears a close resemblance to the Bolshevik leader hangs out near the entrance to the square waiting to pose for tourists for a small fee. With his mustache, goatee and a flat black cap covering his bald head, Soloviev’s resemblance is strong even if his face lacks the beady intensity of the real Lenin’s. He’s usually in the shadows of the ornate red-brick State Historical Museum, on a pedestrian walkway between Red Square and the adjacent Manezh Square, one of the most tourist-dense parts of Moscow. There’s often a man who impersonates Josef Stalin with him, along with one or two other Lenin doppelgangers. Soloviev speaks with pride about how those others were impressed when he first showed up in 2000. “One of the other Lenins said ‘Oh look, here comes my competition,’” he said. How does a person become a Lenin impersonator? He eventually lost the job, noticed other impersonators and went to work. Soloviev attracts a lot of looks, but many of them don’t go further and pay his requested 100 rubles (US$1.75) for a photo. He complains that many Chinese tourists, for whom Moscow is an increasingly popular destination, come with tour operators who tell them the Soviet impersonators will try to rip them off. This offends both his honor and his sense of what he’s worth. “Can’t you give 100 rubles for Lenin?” he asks.